Do you remember the original Time Machine backup animation of the slowly spinning green galaxy vortex? 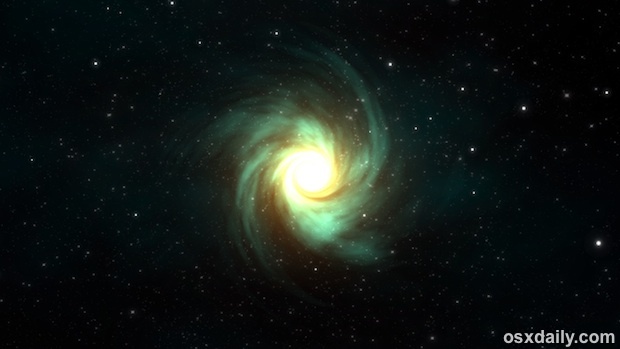 Triggered when a user entered Time Machine for backups, backup file management, or restoring files, the original animation was a snazzy space rendering that sort of looked like entering into a spinning black hole, shooting out stars and space dust, like the screenshot shown here. 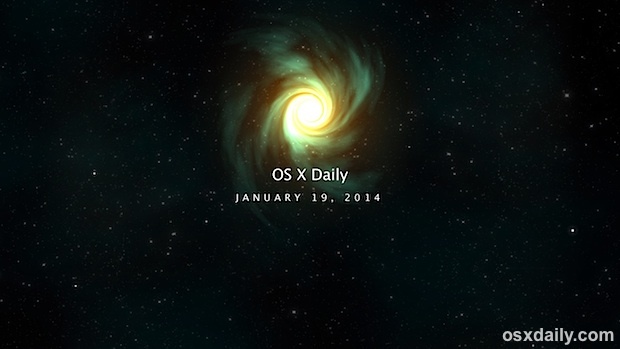 Well, you can have that awesome space vortex as your screen saver on a Mac! The same artist who brought us that gorgeous iOS 7 inspired screen saver to the Mac has created another screen saver based on the elder Time Machine animation. 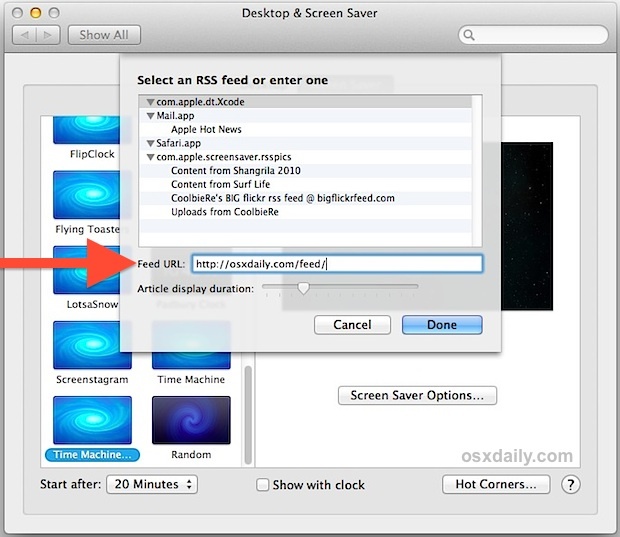 It’s free, and you’ll get two versions; one that is simply the spinning vortex, and another that features an RSS reader flying around atop the vortex, similar to the RSS feed screen saver that existed on prior versions of Mac OS X. Want in? You’ll need to install them manually because they’re Quartz composer files, but that’s easy to do. 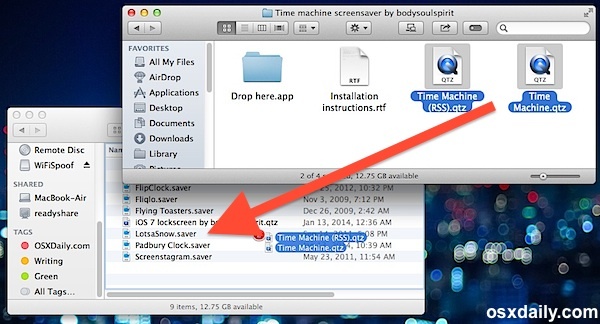 The regular Time Machine screen saver is the background of what was seen when entering the Time Machine backup service to restore old files or to restore from backups in Mac OS X, and there’s no configuration required for that one. 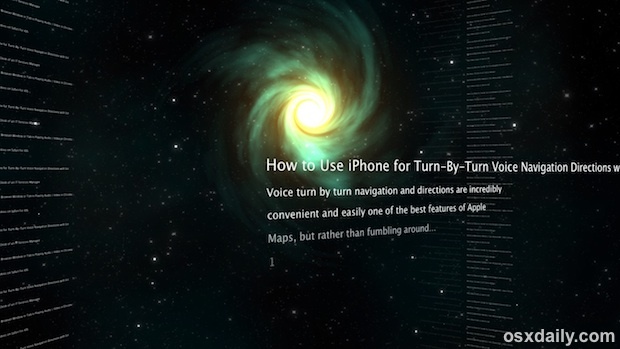 You’re all set, click on “Preview” to see what it will look like, then pretend you’re in Star Trek or your favorite sci fi novel and enjoy the space travels when your screen saver turns on. It’s probably worth mentioning that there continues to be a space animation for Time Machine, but the new version looks different than the green vortex shown here. The latest versions of Mac OS X use an image that more like a purple nebula that doesn’t spin around, instead it’s more like traveling through a space scene from the Hubble telescope. It’s beautiful and fancy too, so perhaps BodySoulSpirit will make another version of the screen saver with the purple nebula animation too? – It’ll make your Mac run hotter. – It’ll eat up battery life when unplugged.